Two months on, the BlogPress app remains hopelessly broken, rendered pretty much unusable by iOS 5. The developer claims the fix has been submitted and is in review - indeed, he claimed this in an email to me a week ago. But given the speed at which Apple reviews apps, I find I ridiculous to believe that it has taken EIGHT WEEKS for Apple to approve the update. 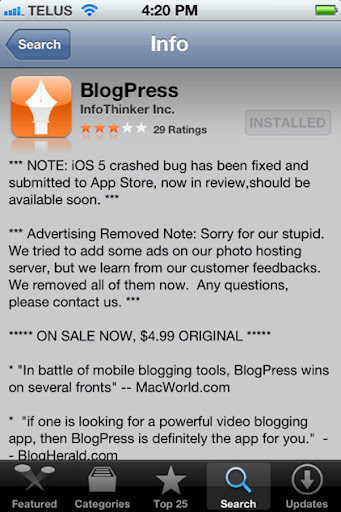 In the meantime, I can only recommend that anyone looking for an iOS blogging app avoid BlogPress until it's fixed. Assuming that ever happens. As far as alternative apps, the official Blogger app is rudimentary but works - and it's free. BlogBooster comes in free and paid flavors and it's OK. This entry is being done with Blogger+. It's also a paid app. But so far I'm liking it an awful lot. Not quite as full featured as BlogPress, but better layout and picture controls than Blogger and BlogBooter. The composing function is a bit counter-intuitive but once you figure it out, it works fine. That's bizarre, particularly since the fix for the iOS5 bug did actually get published on Thursday. That would be WONDERFUL news if it had stayed there. I've been trying to find info/advice--maybe you can help?! Last week, friends of mine on livejournal got malware warnings related to blogpress posts. I deleted the posts and their warnings disappeared. However, now I cannot access livejournal from my phone, either through Firefox or through any livejournal connected app. I tried the contact form on blogpress's website, though it does not appear to go through. I'm really frustrated, what do I do?